Then I went on to making some larger scarves with the silk velvet and these I lined in silk charmeuse. These scarves are so wonderfully plush and the charmeuse is softer than butter. Just lovely! 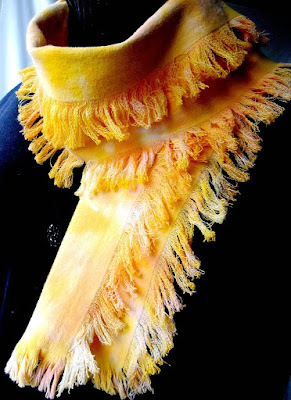 I have also been making some yummi warm double thick flannel scarves. I just LOVE this one! Besides these I have made a rainbow of cotton scarves that are still sitting here waiting to be photographed. Hopefully soon but with everything I have piled up it might take awhile! I am chipping away at the piles as fast as I can. 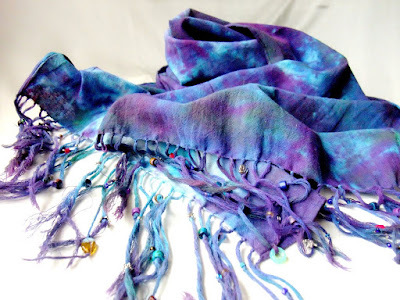 I have a mountain of silk ribbons to list in my shop, more floss and some lovely silk habotai pieces and larger silk gauze pieces for the nuno felters out there. 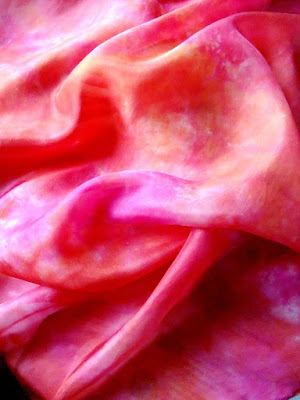 I am also starting to experiment with some silk dyes and might show you some pics of my experiments. I want to be able to get some nice deep blacks and super bright brights on the silk habotai and gauze and that will never happen with procion mx so I must expand my horizons. Lastly I just wanted to send you all a reminder: Dont forget I am having a giveaway on my Artfire Blog and you are almost out of time to sign up. Go there now if you dont want to miss out! Great to see you at work and browse your work in the shops. Lovely things! I'm seriously tempted. Will be coming back for the cottons!